The stock market has been under tremendous pressure for the fourth quarter, causing both financial and mental anguish. Only the bears are profiting right now, as there are a bevy of concerns for bulls.There are a number of upsides to the Vanguard S&P 500 ETF (NYSEARCA:VOO), but should you follow Warren Buffett’s advice? 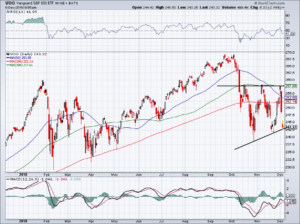 Specifically, should investors still be buying the VOO ETF? Odd that a man who’s become one of the richest in the world by picking individual stocks would tell investors to plow into a Vanguard fund, isn’t it? But it actually makes quite a bit of sense. Most investors don’t have the resources, be it time, research-related or otherwise, to build a portfolio of sound investments. Over the long term, we’ve seen just how powerful stock index funds can be. Combined with a low-fee ETF, consistently adding to this fund over time can be the best bet for many investors. It also diversifies them among their stock holdings. The Oracle of Omaha doesn’t suggest that all investors should avoid individual stocks, but speaks broadly about its benefits. It sure beats paying the 2/20 fees at a hedge fund or management fees for a mediocre advisor who many very well just put their clients in something like the VOO anyway. 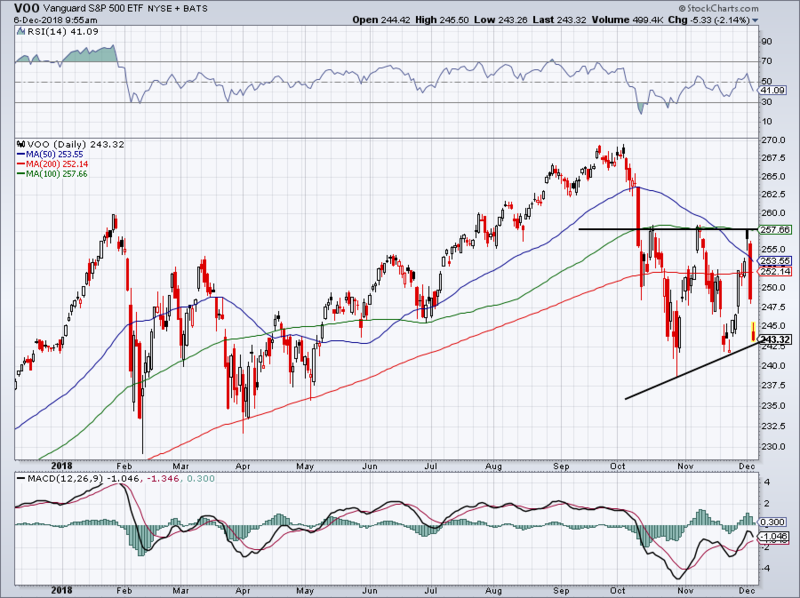 Of course, investing in something like the VOO ETF has its drawbacks too. For one, investors miss out on the massive individual gains they could have in names like Apple (NASDAQ:AAPL), Amazon (NASDAQ:AMZN) and Tesla (NASDAQ:TSLA) for instance. Heck, even buying Bank of America (NYSE:BAC) eight years ago has paid off in a big way. 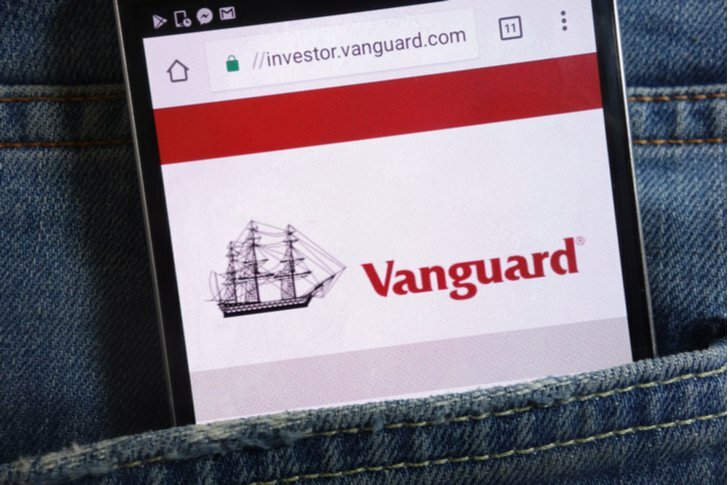 Buy Vanguard ETFs Amid the Turmoil? So there are obvious benefits and drawbacks to S&P 500 exchange-traded funds and Vanguard ETFs. But investors still want to know if they should be buying them during this correction. If investors have been buying things like the VOO ETF consistently, then they shouldn’t stop when prices are lower. Meaning that, say some investors buy a little each month or quarter. I wouldn’t stop the purchases now that stocks are under pressure. Keep in mind, VOO isn’t a trading vehicle. If you want to trade the S&P 500 via an ETF, go with the SPDR S&P 500 ETF (NYSEARCA:SPY), which has a very active trading community. If you’re a long-term investor looking for consistent allocations, then the VOO is a better consideration. Despite having twice the assets under management as the SPY, the VOO trades just a tiny fraction of the volume that the SPY does. It’s important to realize how powerful these vehicles can be when they are used consistently. Whether that’s investing weekly, bi-weekly, monthly or quarterly. For instance, my in-laws put away $25 for each of their two kids with every paycheck they got. Just $650 a year in contributions. It invested every other week — along with any dividends along the way — and amassed a value of roughly $50,000 by the time the kids found out about it at 20 years old. That’s despite contributing “just” $13,000 along the way. Even seasoned investors and trading vets can see the value in contributing to a long-term equity position such as this. Remember, things like the VOO ETF are an excellent way to build a core position in equity markets. Different ETFs can give investors exposure to different sectors as well and they don’t necessarily have to be Vanguard-branded. For instance, the PowerShares QQQ ETF (NASDAQ:QQQ) gives investors nice exposure to Nasdaq-listed stocks and tech companies. For those looking to build around the VOO ETF, they’ve picked a good one. It pays out a 2% dividend yield, tracks the well-diversified S&P 500 and has a five-star rating from MorningStar. Further, it’s expense ratio of just 0.04% is among some of the lowest fees in the ETF industry. If you’re thinking about long-term consistent investments in the VOO, time in the market is far more important than timing the market. Don’t put so much worry and emphasis into the charts and technical readings if your outlook is 10 or 20 years down the road. Bret Kenwell is the manager and author of Future Blue Chips and is on Twitter @BretKenwell. As of this writing, Bret Kenwell is long AAPL and AMZN. Article printed from InvestorPlace Media, https://investorplace.com/2018/12/why-buy-voo-etf/.